I had every intention of posting every night but that obviously hasn’t happened. That fact is a testament to how busy we’ve been. I’ll do my best to review the highlights of the past three days. I’ll start with today and work backwards. The flags were up today! Here's some of the 192! The Pacific islands, between 20,000 and 30,000 islands in the Pacific ocean, are made up of three subregions: Melanesia, Micronesia, andPolynesia. The panel included women from Melanesia (Fiji) and Polynesia (New Zealand), but not Micronesia. The panel recognized this issue as problematic, and representative of the larger issues being discussed, and attributed the absence of a Micronesian women to a lack of resources. They noted that a number of women had wanted to attend. The panel discussion, using a human rights framework, focused on issues of representation faced by Pacific island nations, especially Pacific women. In the United Nations, the Pacific islands are part of the Asian regional group. This is problematic because the Pacific islands is a unique region that faces specific issues that differ from the rest of Asia. It was suggested that the Pacific islands work with the rest of Asia to come to an agreement about permanent or rotating representation within the Asia regional group. A friend of mine in my graduate program has a research interest in environmental health in the Marshall Islands. Following the panel, I was able to ask two of the panelists a question on her behalf. The question was, “Some experts anticipate a rise in sea level of three feet by the end of the century. Given the susceptibility of many of the Pacific islands, particularly atoll countries, to changes in sea level, are you planning for possible displacement contingencies for the people of this region?” The answer was that they have no longterm strategic plan but are responding as environmental issues as they occur. It was noted that the largest obstacle in developing a longterm plan is the global denial of climate change as a danger. 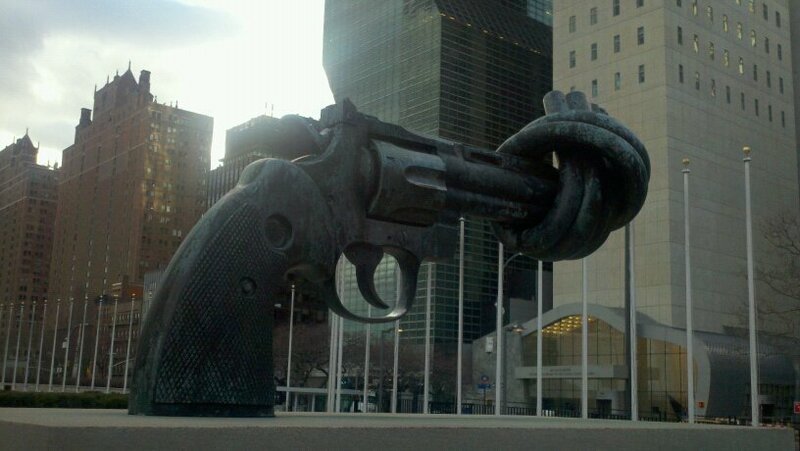 The second event I attended was “Learning Methodologies: Post-Trauma” sponsored by Ecumenical Women at the United Nations. The panel was impressive and each woman had a powerful story to share. The panel consisted of an ordained Lutheran minister from India, a peace-building specialist with expertise in trauma healing from South Sudan, a domestic violence shelter coordinator from Brazil, and an American urban minister. The moderator was an American educator and artist. Talk about some amazing women! The Rev. Dr. Surekha Nelaval told a moving story about a Dalit girl which illustrated the traumatic effects of patriarchy, casteism, and classism on girls in India. Cecilia Castillo spoke about her work with victims of domestic violence in Brazil. Milcah Lalam shared some of the techniques she uses in trauma healing in her work in South Sudan. These techniques include storytelling, games, coloring mandalas, and drawing. Lalam identified the need for leaders to do their own healing before they take on the care and wellbeing of others. The Rev. Heidi Neumark spoke about her work in the South Bronx and the traumatic issues that children face in their young lives. Neumark named three ways to create paths for healing: (1) creation of spaces that nurture hope, (2) cultivation of a space of trust and solidarity, and (3) creation of spaces to explore the stories of biblical sisters. She stated that biblical stories of trauma affirmed and validated trauma victims, even when the stories did not have happy endings. Because the stories were included in holy texts, women who could relate felt like their stories also matter. She also mentioned the healing qualities of exercise (like yoga) and beauty and relaxation practices. These things teach girl victims of trauma to care for their body, a place that has been often been dishonored by others. The panel was inspiring and offered practical advice to others working in areas of trauma. I was fortunate to have an opportunity to ask a question at the end. I asked how trauma healing and treatment can be incorporated into the work of UN Women as part of women’s mental health. The panelists acknowledged that doing so was necessary and that the only mention of women’s health so far this week has been maternal health. I was thrilled to hear their answer because this is something that I’ve noticed and have been concerned about. Women’s health must not be defined as maternal health. There are so many other areas of women’s health that cannot be neglected (e.g. sexual, reproductive, mental, and preventative health). I will be sure to reflect upon and write more about this at the end of the week. Please see my next post for a (more photographic) description of the rest of my day. Post will be up tomorrow. To anyone planning to travel between Boston and New York, I highly recommend taking a bus. I left from South Station and four short hours (the bus was equipped with wifi) and I arrived in the Big Apple. I took a cab to my hotel where I met some of the other women participating in the Practicum. 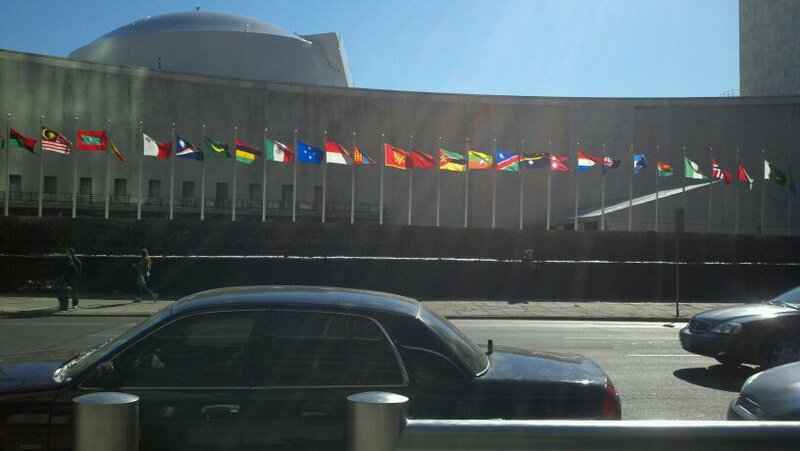 A few of us walked over to the UN (about two blocks) and picked up our grounds passes. 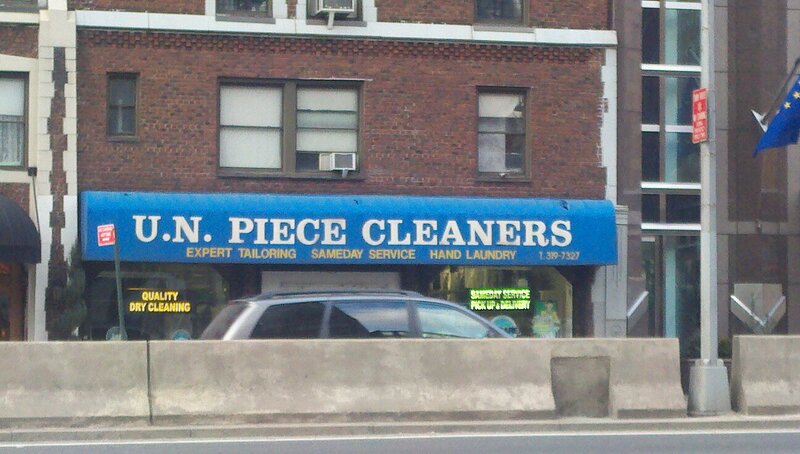 Where the peacemakers take their dry cleaning. I’ve been excited about this week for months, but I must say that having an official UN pass in my hand made my excitement grow exponentially. The UN security is all international (naturally) and hearing some familiar and unfamiliar foreign accents, I can already tell that though this experience may temporarily satisfy my wanderlust, I will leave needing to use my passport in the near future. This evening, over New York-style pizza, we each started to learn the names of the other 22 practicum participants. We are a diverse group coming from all parts of the country with different academic backgrounds and interests. The group is mix of undergraduate and graduate students, and I know there is a lot we can learn from each other. Tomorrow we will have a day of orientation, but we began to discuss some of the ideas and themes of the week. The United Nations has designated the priority theme of the 55th Session of the Commission on the Status of Women as “Access and participation of women and girls to education, training, science and technology, including for the promotion of women’s equal access to full employment and decent work.” Our discussion tonight got me thinking about my experiences of science and technology and how these have influenced my direction, both academically and otherwise. As a sophomore in college, I was pre-med and had every intention of going to medical school. With Comparative Vertebrate Anatomy and Organic Chemistry on my schedule, I decided to round things out with French Literature. It seemed like a great idea until I sat through one class of French Literature — not my thing. I quickly researched my other course options and decided that my best option was to pick up Introduction to Women’s and Gender Studies (WAGS). From the course description, I figured it would hold my interest more than my a close relationship with my French dictionary. After running around campus to get my course change paperwork signed (and after my French professor lovingly slammed his door on me when I asked him to sign the form), I walked into Intro to WAGS five minutes late. The desks were arranged in a circle and there was an index card on each desk. What had I gotten myself into? I was a science student and used to lecture halls with podiums where the professor poured his (yes, only his — I never had a female science professor) knowledge about hydrogen bonds or the Krebs cycle into our clueless minds. The desks in WAGS were in a circle.I was the only science student in the course, and to be honest, I had never thought much about gender. My first assignment was to think about gender. For three days, we were required to keep journal about the ways that our lives involved or were affected by gender. For example, I would write down that I went into the women’s bathroom or that I checked the “female” box on an application. As I kept a list, I realized that the part of my life that made me most conscious of my gender was the science lab. My academic life soon felt like two conflicting worlds. But when your life is pulling you in two directions, you make it work until it works out. Though I dearly loved the WAGS program at the first college I attended, I transferred to Loyola University Chicago to complete a degree in Criminal Justice with a minor in Women’s Studies and Gender Studies. This diverse academic background along with study abroad in India, Spain, and Morocco led to my current interest in global women’s health. So here I am, in graduate school for Women’s Health (and thankful I didn’t have a love for French literature). Click here to read “I’m Not in Lab to Wash Dishes,” the paper I wrote as a college sophomore. As always, I welcome your comments and questions and thank you for reading. BOSTON – Michelle Pomerleau, a student in the Master of Arts in Women’s Health program at Suffolk University, will gain experience in the art of advocacy as a delegate to the annual Commission on the Status of Women meetings to be held from Feb. 22-March 4, 2011 at the United Nations headquarters in New York City. Pomerleau is one of 23 women students chosen from across the nation to participate in the Practicum in Advocacy at the United Nations, a week-long program which offers an opportunity to observe how the UN works to address issues requiring multilateral engagement and coordinated action between governments and civil society groups. Pomerleau’s temporary delegate status will allow her to attend official and non-government organization (NGO) sessions, and contribute to the official documentation of both official and NGO meetings. The practicum on the Commission on the Status of Women is sponsored by the Center for Women’s Health and Human Rights at Suffolk University, Boston; the Women’s International League for Peace and Freedom and the National Women’s Studies Association, with assistance from Physicians for Human Rights. “We teach the women how important citizen engagement is,” said Laura Roskos, co-president of the Women’s International League for Peace and Freedom and activist-in-residence at the Center for Women’s Health and Human Rights. The participants will learn how to network with NGOs, observe high-level negotiations, meet government officials and participate in turning specific proposals into documents that can be adopted by U.N. bodies. Pomerleau must also create an advocacy project when she returns to the Suffolk University campus. “This success empowers them to engage in successful civic campaigns on their campus and local communities,” noted Roskos, who with Connie Chow, Executive Director of Science Clubs for Girls, will serve as faculty for the 2011 practicum. “As a women’s health advocate, I plan to use this opportunity to expand my knowledge and understanding about global health while improving my advocacy skills and building international connections,” Pomerleau said. 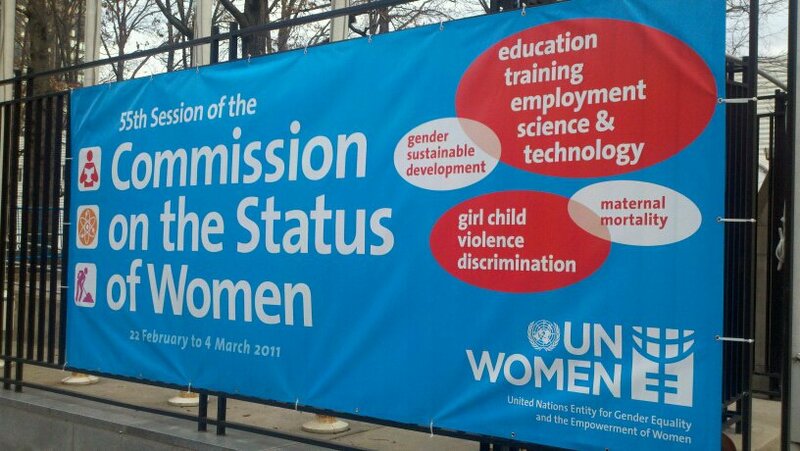 This will be the fourth practicum at the Commission on the Status of Women. The CSW focuses on gender equality and the advancement of women, with the U.N. drawing representatives of governments to address the problems facing women around the world. This year more than 3,000 registered representatives from NGOs will lobby the delegates about current issues and work to put new ideas on the table. The NGOs engage in and host hundreds of events, such as performances and panel discussions directed at the local, national and international issues affecting women. See Suffolk University’s press release here. October is Breast Cancer Awareness Month and the town is painted pink. During my last trip to the grocery store, I was surrounded by products claiming their commitment and support to the cause of breast cancer awareness. As someone passionate about women’s heath and a firm believer in education as a tool for disease prevention, I am glad that Breast Cancer Awareness Month is cause that everyone wants to participate in. However, I wonder if some companies are taking advantage of the power of the pink ribbon and “pinkwashing” their products. Other than the pink packaging and the claim that the company was a supporter of breast cancer awareness, there was no other information about what this meant. It was unclear whether the company actually financially supported any breast cancer organizations or initiatives and if so, what these were. When I got home I looked up the company’s website to find out more. I found that the company donated $25,000 to theAmerican Cancer Society Making Strides Against Breast Cancer Walk in Boston. Though it is debatable whether this amount was significant to the company (my guess is not), I must give them credit for providing a list of tips on awareness and prevention. However, the packaging did not guide consumers to visit their website to view these tips, learn more about their pink initiative, or even encourage participation in events like the breast cancer walk. The biggest issue I have with the pinkwashing is that companies are using the pink ribbon for marketing purposes and missing the significance behind the pink ribbon — saving women’s lives from breast cancer. Because it’s incredibly important, I want to suggest some resources for you to visit now. The American Cancer Society provides information on their website about screening recommendations and if a mammogram is recommended for you, there is mammogram reminder service that will send you an email once a year during the month of your choosing. For more detailed information, the American Cancer Society’s Breast Cancer Guide is a great resource. And as always, ask your doctor about any specific questions or concerns about your health. So please be sure to take care of yourself and to make sure your loved ones are doing the same. Wear your pink ribbon proudly, knowing that you have the facts you need and are taking action to advocate for your health.